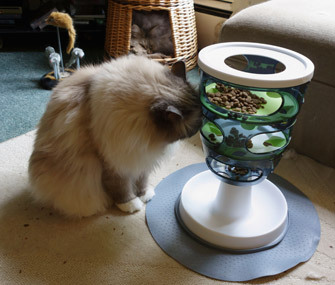 Feeding station puzzles challenge your pet by dispensing food through lifting flaps, opening doors and pressing switches. Food bowls are a convenient way to feed pets, but they may not be in every pet’s best interest. The bowl may allow pets to eat too quickly, which can cause vomiting. Since it takes time for a meal to trigger “I’m full, stop eating” signals from the brain, it can also lead to obesity. Further, if the amount in the bowl isn’t controlled, it can become a 24-hour buffet, which can contribute to obesity and the health problems it can cause, such as decreased quality of life and reduced longevity. While we’d all like our pets’ days to be full of fun activities and mental stimulation, the reality is that many of them spend their day simply waiting for us to come home from work. Making mealtimes longer and more interesting through the use of a food toy is one way to provide enrichment for pets waiting for their favorite people. You may think that since your pet has access to toys or a yard while you’re away, he may be thoroughly entertained without you. However, most pets don’t engage in much play on their own. A pet activity monitor can tell you for sure, but many pets appear to experience boredom and sleep the day away. While sleeping helps pass the time, it doesn’t burn many calories or provide mental stimulation. Some pets appear to experience anxiety without their people, and some can be destructive when left alone — whether as an expression of that anxiety or as simply a way to entertain themselves. Though a food toy may not be a good option for every pet — and a talk with your veterinarian can help you determine whether or not you should try one — many pets seem to find them highly entertaining. Dispenser-type toys dispense dry food or treats through an opening when the toy is turned, rocked, pulled or otherwise manipulated in just the right way. These are usually made of harder plastic materials and are taken apart by the owner to fill. Give it to your pet in an area where toy flinging, rolling and bashing won’t cause damage or annoy your neighbors, as some of these can be quite loud on hard surfaces. Chewing-type toys can be filled with dry or canned food (some of them even come with commercial paste-type fillers), and the pet’s chewing action releases the food. Give these to your pet in an area where making a mess is less of a concern. Freezing the food after the toy is filled can sometimes help to further slow meals down and reduce cleanup. Feeding stations require a pet to interact with a larger, non-mobile object to release (usually dry) food. These include puzzles that require pets to figure out how to lift flaps, open doors, flip switches or spin knobs to access food. Also, while not truly toys, if you’re really looking tojustslow your pet’s food intake, there are bowlreplacements with deep grooves for food that make it harder for him to inhale a meal.